Adelaide Hills Business Centre: Bookings Now Open - Taking Stock SME Sustainability Conference 2015 for Adelaide Hills, Fleurieu & Kangaroo Island Business Owners. 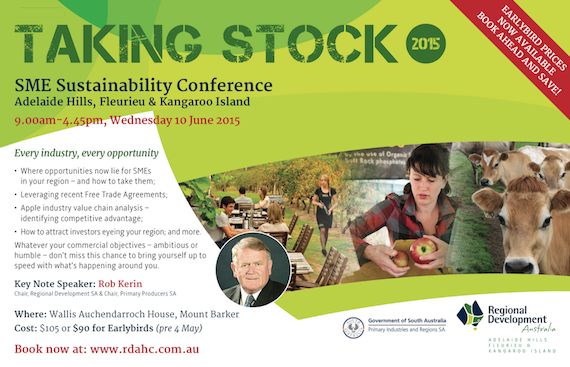 Bookings Now Open - Taking Stock SME Sustainability Conference 2015 for Adelaide Hills, Fleurieu & Kangaroo Island Business Owners. How to attract investors eyeing your region; and more. Whatever your commercial objectives – ambitious or humble – don’t miss this chance to bring yourself up to speed with what’s happening around you.